Venerable Hsin Ting (心定和尚) (born 1944) was the sixth abbot of Fo Guang Shan, an influential Buddhist monastery and the largest religious organization in Taiwan, from 1997 to 2005. He served as acting abbot for three years after the death of his predecessor, the Ven. Hsin Ping. Hsin Ting, after Master Hsing Yun, is the second highest monastic in the Fo Guang Shan Buddhist Order. Venerable Hsin Ting was born in central Taiwan in Yunlin county. He was born into a family of farmers and grew up in the country. In 1968, he took the tonsure under Master Hsing Yun and took full ordination the following year in Keelung. Ven. Hsin Ting graduated from the Eastern Buddhist College and the India Research Institute of the Chinese Cultural University. He further received a Honorary Doctorate Degree from the Fo Guang Shan-affiliated University of the West in Rosemead, California in 1998. 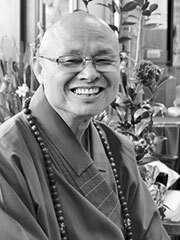 Venerable Hsin Ting is a carrier of the torch for Master Hsing Yun’s ideal of Humanistic Buddhism. He has held a variety of posts: secretary of Fo Guang Shan’s Religious Affairs Committee; Managing Director of Ilan Buddhist Society; Abbot of Lung Wah Temple in Malaysia, of Hsi Lai Temple in the U.S., of Taipei’s Pu Men Temple, and of Kaohsiung’s Pu Hsien Temple; President of the American Buddhist Youth Association; and Vice President of Buddha’s Light International Association of R.O.C. Venerable Hsin Ting was elected as Fo Guang Shan’s sixth abbot by the temple’s Religious Affairs Committee in May of 1997. A multi-talented monastic, he is well versed in speaking the Dharma, construction projects, Buddhist chant, and the composition of music and lyrics.